My agent-sibling Bill Cameron once said he was psychologically scarred for life because his step-mum made him eat Vegemite as a child. (I gather she was of an antipodean disposition). It was Bill's trauma which inspired me to take Vegemite on my trip to the US, so I was devastated when he decided not to go to Bouchercon. Two kind ladies called Carrie and Jeanette saved the day when they offered to carry Bill's jar back to Portland. I didn't mention this until now because I wanted Bill to, errr, appreciate the surprise. Thank you Carrie and Jeannette! I'm reliving the trauma even as we speak. 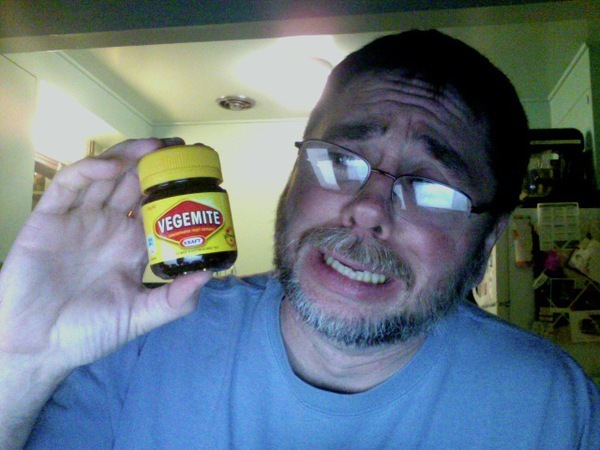 Actually, I've suggested a Vegemite tasting this weekend, most as a chance to subject my children to the same trauma. They are dubious, but I intend to soldier on! Toast, lots of butter, and spread the black stuff *very thin*, and they might survive. That which doesn't kill us makes us stronger, right? My kids have consumed their own weight in Vegemite. Yours will live to curse me. As a "vegie" I feel it my duty to eat a similar preperation, "marmite"; on the plus side I suspect this is a bi-product of the brewing industry. LOL Gary. I have been reading all about your trip to the US and think you are doing a wonderful job of scaring the crap out of the Americans brave enough to try that stuff. Keep up the good work. Never had the stuff but the name alone terrifies this carnivore. Tabitha, when I opened the jar in the presence of my daughter, she made a ~meep~ sound and fled the room. She's 24. You'd think she'd be up to this. My son, age 14, said, "It needs hot sauce." Ewww... Hot sauce on Vegemite. The mind reels from the combination. Hot sauce on Vegemite...I'm afraid this closes off "gourmet chef" as a career option for your son, Bill. Travis, Vegemite should be totally acceptable to you because, as Geoff correctly says, Marmite and Vegemite were both originally made from the residue at the bottom of beer barrels. Think of it as eating leftover beer. I cannot speak for my son's palate. He asks to put hot sauce on EVERYTHING. Why is it that the picture and name of this concoction reminds me of the "Vita-meata-vegimin" episode of I Love Lucy? Dang, I've long had a fascination with Vegemite. If I'd only known you had some in Indianapolis! Blast, sorry Peter! I could have given you a jar. Of course that would have required me to be going round telling people I was carrying Vegemite, which would have been more than a little weird. I have indeed read Pratchett's The Last Continent. My favourite bit was when they meet the God Of Evolution. I'm sure you're refering to when Rincewind invents Vegemite while trying to make beer soup. He's not that far wrong. Good heavens, you two - love that photo of bill, though! Hey Sophie! If I'd thought of it I could have had a Vegemite tasting at Bouchercon, and then I'd have a photo of you tasting it too. Think yourself lucky you escaped. Bring some Vegemite to San Francisco. Yes, that's what I was referring to. :) I'm sure I missed a ton of references in that book! I didn't figure out the Waltzing Matilda references until after a young musician friend and I spent an afternoon trying to figure out the story behind Rod Stewart's take on the song. OK Peter, I'll bring some to the next Bouchercon. Loretta, I probably didn't get all the references either. I'll say in passing XXXX is an awful beer.